I was in the grocery store on the hunt for a Gluten-Free nosh. I was out of my usual stash of snacks, and wanted something satisfying. Trying to stay gluten-free makes that next to impossible, I’m sure I don’t have to tell you that. The words ‘satisfying’ and ‘gluten-free’ are seldom used to describe the same item. 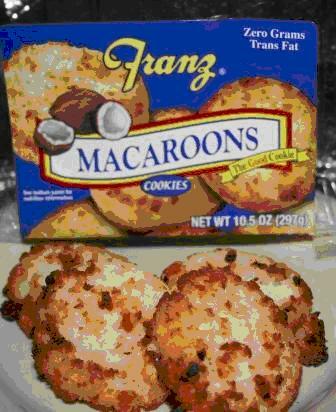 Curiously, Franz Macaroon Cookies jumped out at me. I checked the package, and the ingredients: Dessicated Coconut, Sugar, Water, High Fructose Corn Syrup, Corn Syrup, Potato Starch, Dextrose, Egg Whites, Artificial Flavor, Soy Lecithin (Soybean), Nonfat Milk. Those ingredients certainly didn’t seem dangerous to me, so I decided to purchase the package and check the Franz web site to see if I could get further information about the gluten content. I do not believe I am as sensitive as most people to gluten, so I dug right in. They are chewy, loaded with coconut, moist, tasty and sweet. They are, in fact, satisfying when that quick snack urge rears its ugly head. There are none of the tell-tale drawbacks that normally accompany gluten-free cookies like dryness or grittiness. These are like the macaroons I enjoyed during my childhood. Franz’ slogan on the package reads “The Good Cookie.” And their macaroons certainly are good! What Would Howard Jones Think? “You can look at the menu but you just can’t eat” are the first words of the brilliant song “No One Is to Blame” by Howard Jones. I loved the irony of the song back in 1985. I never in my wildest dreams thought that twenty years later, it would become my food allergy anthem. Later in the song, Howard goes on to sing “Doctor says you’re cured, but you still feel the pain, aspirations in the clouds but your hopes go down the drain.” Every time I try a new treatment or doctor – that is exactly how I feel. I enjoy helping others with food allergies by experimenting with new recipes, exploring different food combinations and venturing into purveyors of good eats for food allergy sufferers. I remember how I felt when I was first diagnosed with Celiac Disease. All my efforts are in hopes of helping as many people as possible not feel the same panic and isolation I did. But sometimes the discouragement is overwhelming. Usually I don’t let it get to me, but in the past couple of weeks we discovered yet another food I cannot tolerate. Now I’m up to seventeen. At this rate, the food of choice for me will be ice. “Great!” I said, taking a minute to realize that just because that meant I wasn’t fat didn’t mean it was a good thing. So I broke down and called the food allergist that had been recommended to me. It sounded like a bunch of hocus pocus, but if it works, who am I to judge? But if it really works, then why isn’t this guy world famous? Are all those testimonials for real? If it doesn’t work, I’m out a lot of money. But if it works, it could change my life. But if it doesn’t work, wouldn’t the medical board have shut him down? And so on, and so forth. If you have allergies, you understand where I’m coming from. How do you think Howard Jones would feel about my twist on his song? I think it’s kind of sad.